Should I mention Depression/Anxiety on my College Application? Sometimes it takes unspeakably tragic events to bring the existence of a widespread problem into the national conversation. In the past decade, highly publicized suicides at UPenn, Hamilton College, MIT, NYU, and Cornell, among others, have moved the discussion of mental health services on campus right to the forefront of the higher education discourse. Thankfully, these are, of course, extreme cases of mental health challenges, but the shift in focus could benefit the massive numbers of students who enter college each year with depression/anxiety. According to a survey by the CDC, released in 2018, 32% of American adolescents reported feeling persistent feelings of sadness and hopelessness; 17% said that they had considered suicide at some point in their lives. Perhaps more startling is that national statistics on the diagnoses and treatment of such disorders skew low, with only 12% of teens actually being treated for a Major Depressive Episode. In this piece, we will offer recommendations for dealing with depression/anxiety on your college application, but perhaps more importantly, we will share what mental health experts and current research says are important considerations for managing your illness on campus. *Disclaimer: Mind you, we are college planning experts, not mental health experts—we are merely summarizing mental health considerations as related to college admissions and attendance. Your mental health provider may offer additional advice based on the specifics of your situation. 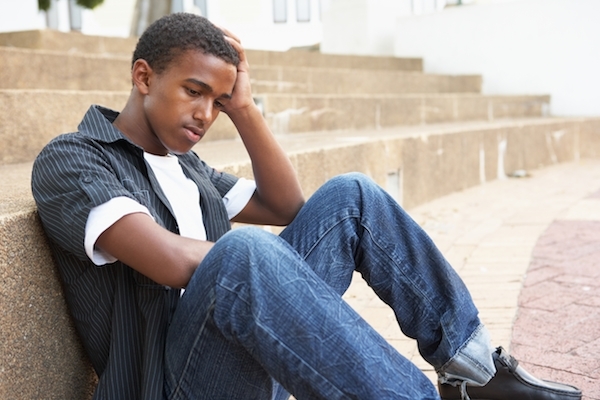 For many, dealing with a mental health condition will negatively impact their high school career in some way, potentially impacting areas such as academic performance, school attendance, teacher relationships, and extracurricular involvement. There is ample statistical evidence to support this—students with social phobia are twice as likely to fail a grade as those without. Students with a depression diagnosis have been found to earn significantly lower grades than their similarly-abled peers. Given the impact of mental illness on a teen’s academics, a significant number of high school seniors are faced with a difficult choice each year—do I reveal my condition on my college application? There is no blanket answer that will guide every applicant. Ultimately, the decision to reveal your condition is an entirely personal one. Did your academic performance suffer? Perhaps your mental health issues were managed successfully and never impacted your grades. If this is the case, we advise that there is no reason to reveal your condition on an application. You should, however, still check out our recommendations on how to check out a college’s mental health services (below). Overcoming challenges and citing evidence of personal growth can be a winning story arc. If a bout of depression during your sophomore year contributed toward failing grades but you received treatment and rebounded academically the following year, then revealing that journey may be extremely helpful to your admissions chances. Knowing that you faced a significant challenge in your life and successfully emerged from it speaks volumes about your resilience, maturity, and grit, traits that are greatly valued by admissions officers. Another approach is highlighting the strength that you draw from what others call an “illness.” An associate of Abraham Lincoln said of our 16th president that the “melancholy dripped from him as he walked.” Yet, many historians feel that Lincoln’s lifelong depression sparked a great deal of his legendary wisdom, insight, and brilliant strategic thinking. Lincoln was hardly alone; many of the greatest, most creative minds throughout history were, at least in part, driven by mental conditions. Darwin, Michelangelo, and Einstein were all likely sufferers of Obsessive Compulsive Disorder. If we were to list all of all the great writers, artists, comedians, actors, and directors who were influenced by depression and anxiety, this blog post would be longer than the 1,017 page novel, Bleak House, penned by Charles Dickens, who was himself a lifelong victim of severe depression. Cautious applicants might consider simply substituting the term “medical condition” for “mental illness.” After all, depression, anxiety, and the like are treatable medical conditions in the same vein as mono, kidney surgery, or any other condition that might disrupt one’s educational experience. Simply stating that you were afflicted by a “serious medical condition” which caused a temporary academic decline and led to you quitting the school newspaper and the baseball team will suffice. In a recent survey of college students with a diagnosed mental health condition, 45% rated their respective college as being somewhere between supportive and very supportive. The other 55% felt that mental health care on campus was less than ideal. Factors that were rated as being most important by students included: access to a psychiatrist for medication management, a 24-hour crisis hotline, community connections to additional mental healthcare, and the school’s overall culture of understanding that college can be stress-inducing and that mental health is paramount. It is essential that parents and students research the mental health services on campus ahead of time. Check out each prospective college’s counseling office online to get a sense of what is available to students. If a college does not offer long-term therapy on campus, then parents should take the reins and find a good private therapist located near campus who accepts their insurance. This should be done well in advance. Many state universities, despite budget crunches, are recognizing the need to expand their mental health offerings. For example, in the fall of 2017, UCLA offered free online screenings for depression; 2,700 students took advantage. Ohio State opened a dozen new mental health clinics in 2016. Penn State has increased their spending on mental health significantly in the last few years. The University of Michigan and Virginia Tech, in an attempt to make mental health more accessible, have embedded counselors in buildings around campus, rather than at one centralized location. Amherst, Skidmore, Princeton, Drexel, and Carnegie Mellon are just a handful of schools that now offer access to 24-hour crisis hotlines manned by either peers or professional counselors. Unfortunately, excessively long wait times for a counseling appointment at many schools persist. At schools like Northwestern, Carleton College, Washington University in St. Louis, and Creighton wait times to see a counselor range from one-to-three weeks. College Transitions bottom line: If you are going to discuss your depression, anxiety, or other mental condition in your application, do so in a strategic manner for the purpose of illuminating otherwise unexplained inconsistencies in your academic record. A well-conceived and well-delivered narrative about your struggles with mental illness can be beneficial to your admissions chances; a poorly crafted disclosure may have the opposite effect. Of even greater importance is that you do your research on the mental health services offered at each of your prospective colleges—ensuring that the necessary supports at your disposal may be critical to your overall well-being as well as to your academic performance over the next four years.